Researchers at the University of Southampton have developed a new computational way of analysing X-ray images of lungs, which could herald a breakthrough in the diagnosis and assessment of Chronic Obstructive Pulmonary Disease (COPD) and other lung diseases. A multi-disciplinary team of mathematicians, clinicians, and image specialists from three University of Southampton faculties has devised a method for numerically describing the complicated three-dimensional structure of the lung using topology – a part of mathematics designed specifically for the study of complex shapes. 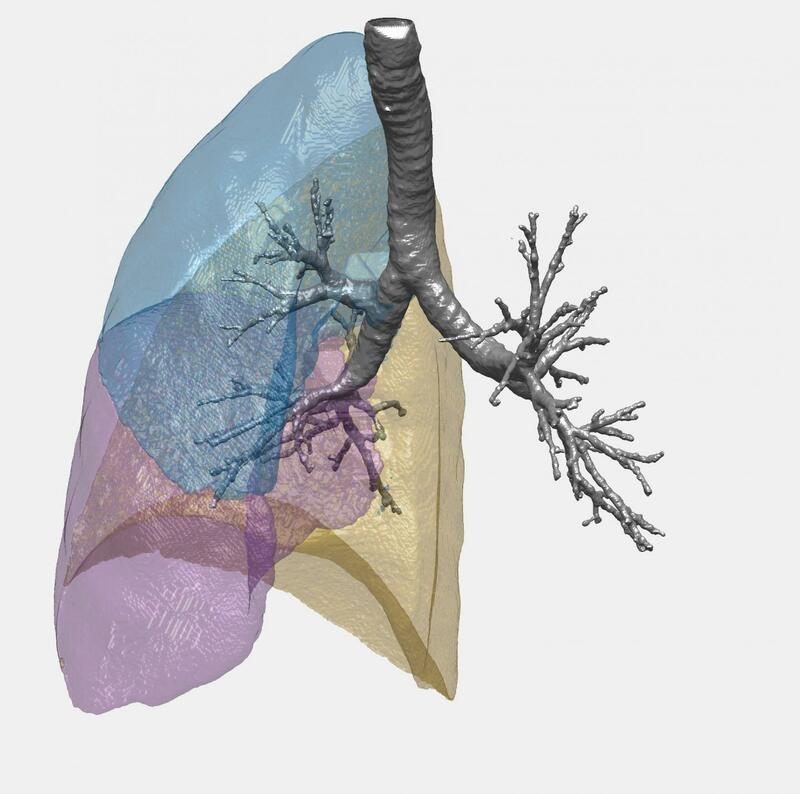 Utilising a combination of computed tomography (CT) scans, high-performance computing and algorithms, the researchers computed numerical characteristics, in three dimensions, of the entire bronchial trees of 64 patients categorised in four different groups: healthy non-smokers, healthy smokers, patients with moderate COPD and patients with mild COPD. COPD is a complex lung condition that involves, to various degrees, the airways (bronchi) and the lung tissue (alveoli); this results in a progressive loss of lung function. It affects more than 200 million people worldwide – middle-aged or older adults, mainly those who have had significant exposure to cigarette smoke. It is the fourth leading cause of death worldwide. The team analysed such features as the structure and size of the bronchial tree, the length and direction of its branches and the comparative changes in shape during deep inhalation and full exhalation. They found that, typically, a larger more complex tree indicates better lung function and a smaller distorted tree, poorer lung function. The researchers found that their novel method was able to accurately distinguish between the different groups of patients, the characteristics of their lung function and the different stages of their condition. It was able to identify charactaristics not detectable to the naked eye. Furthermore, they hope that repeating this method across a much larger database of images and combining it with other data could lead to the real-world development of a valuable clinical tool for the early diagnosis of conditions like COPD and asthma – providing a more accurate way of identifying the severity of an individual patient's condition. Lead researcher and Professor in Mathematics Jacek Brodzki, of the University of Southampton, says: "Until now, the severity of lung conditions has been assessed by using a spirometer – a device which measures the force and amount of air a patient can exhale – and two-dimensional CT images, assessed by expert specialists, who have extensive experience of examining and interpreting CT imagery, and using relatively simple measures of lung density and bronchial wall thickness. "Our study shows that this new method, employing topological data analysis, can complement and expand on established techniques to give a valuable, accurate range of information about the lung function of individuals. Further research is needed, but this could eventually aid decisions about the treatment of patients with serious, or potentially serious, lung conditions." Professor of Medicine at the University of Southampton and NIHR Senior Investigator, Ratko Djukanovi?, comments: "This method is a major advance in our ability to study the structural abnormalities of COPD, a complex disease that affects so many people and, sadly, results in significant morbidity and mortality. "The image analysis method developed by our University's mathematicians is the first to apply the field of topology in lung diseases, and one of only a handful of studies of this kind in medicine in general. Southampton is a great place for collaborative research of this kind, so we look forward to working further with our mathematician colleagues to develop this method for use in routine clinical care." Professor Joy Conway, of Heath Sciences at Southampton, adds: "This study is a unique collaboration between clinicians and mathematicians which gives us new insight into the interpretation of this kind of CT scan data. With further research, it holds great promise for improving patient treatment in the future." The paper Lung Topology Characteristics in patients with Chronic Obstructive Pulmonary Disease is published in the journal Scientific Reports. The study was carried out by University of Southampton academics Dr Francisco Belchi, Dr Mariam Pirashvili and Professor Jacek Brodzki (lead) of Mathematics. Also Dr Michael Bennett and Professor Joy Conway of Health Sciences and Professor Ratko Djukanovi? of Medicine. It was supported by the EPSRC grant Joining the Dots: From data to insight, EP/N014189/1.